Move over fall foliage, the snow season is coming fast and furious this year. The earliest storms have been dumping on the Rockies, Lake Tahoe and oddly enough, West Virginia, but on Wednesday the northeast got a bit of the white stuff too. Off and on showers left [R436R, Sugarloaf] with a nice little dusting up on the summit. After what was thought to be merely frost was confirmed as genuine snow, word spread like wildfire across New England. "It's our first snow of the year, and even though it was hardly enough to make a snowball out of, it means that winter is surely just around the corner," Sugarloaf Communications Manager Ethan Austin said. Despite the widespread excitement felt by Sugarloafers everywhere, the upcoming forecast is calling for more temperate and sunny weather over the next week, which all in all is a good thing for the mountain. Thinning out brush in Brackett Basin. Photo Courtesy of Sugarloaf Mountain. The crew at Sugarloaf is still cranking away on the installation of their new Skyline Quad. 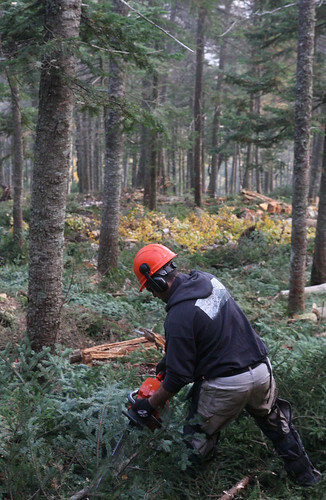 Chainsaw-weilding glade workers have been hastily clearing fresh chutes and expanding the terrain in Brackett Basin. Not to mention the grooming team is anxiously awaiting the delivery of two new Prinoth BR 350 groomers. Needless to say, there's still plenty to do before the season gets underway. 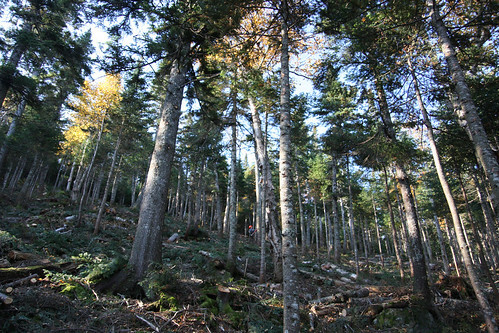 Freshly cleared glades in Brackett Basin. Photo Courtesy of Sugarloaf Mountain. Sugarloaf hosts their Homecoming Weekend from Oct. 7-9, which includes the CVA Used Equipment Sale, the Sugarloaf Annual Meeting, the Homecoming Auction, Uphill Climb and the Maine premiere of Meathead Films' newest movie "Prime Cut"—featuing footage shot on location at Sugarloaf. For more information about the weather at Sugarloaf and what to expect this season, read their blog, visit sugarloaf.com or call 207-237-2000.